Syd Bolton has been actively playing video games for over 30 years. His passion for games grew stronger as his love for computers evolved from the early days of the original IBM, Apple II, Commodore 64 and VIC-20. This symbiotic relationship has led to the creation of Brantford's Personal Computer Museum (Canadaâ€TMs only interactive historical computing centre) and has also help make Bolton Canada's top video game collector. Recently, Syd completed his Xbox collection (almost 900 games) and is currently attempting to build a love seat out of old game cartridges. 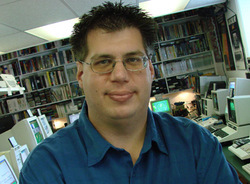 He is often regarded as a knowledgeable historian of gaming culture and the games that built the industry.